Hiking is a fantastic experience. It is filled with possibility and adventure at every corner, and even if you go to the same place more than once it always feels different. Whether you are alone or in company, it is freeing, uplifting, and just gives you some time to be with yourself and away from the stresses that come with everyday life. What every outdoorsman (and woman) needs is a good watch, and that is why we have gathered some of the best outdoor watches, along with the associated outdoor watch reviews, so that you can find one that is absolutely perfect for you. Take a look, and we’re sure you’ll see it. When it comes to selecting your outdoor watch, there are things you need to think about. After all, there is a wide number of them on the market, and many serve different purposes or are more/less advanced than the other. This section aims to take you through some of the ways in which you can help yourself to choose wisely. The first thing you need to ask yourself is what you will be doing the most when you are outdoors. Will you be hiking? Climbing? Skiing? A combination of them all and more? Do you need the best waterproof smart watch? These questions are useful when it comes to building the foundations you will use to choose your ideal watch. If you are just going for long walks in areas you know, then a simple wristwatch that was made to be more durable and resistant to the outside world might be the best bet. They tend to be water resistant and tell the time/date, but are ultimately quite simple and therefore affordable. However, for serious hiking and sports, you might want to think about something more advanced. At this point, you need to determine what your budget is – some outdoor watches are priced very high, but worth the cost, and others good quality but with much lower price tags. A watch that contains a compass is a must, and the same goes for a barometer and altimeter. These will help you if you get lost, but also let you know more about your surroundings. There are a couple of things to keep an eye out for when you go to choose your outdoor watch. The first of these is the additional features. Aside from the key ones that have been listed in the above section, things like storm warnings and underwater usage can be incredibly useful if you plan on a very active trip, or one that takes you to place with tumultuous weather conditions. Accessories such as rope and fire starters should also be considered. If you are going somewhere where it is easy to get lost, it might be worth considering a watch that contains these elements, along with ones that have whistles built into them to call for help. It always pays to be prepared. Comfort is also a factor to consider, along with weight. After all, you will be wearing this watch for quite some time, and so it is important that it does not rub against your skin as this can cause sores to form as well as discomfort. All that’s left is to choose the perfect one for you. Take a look at our outdoor watch reviews for some of our favourite models. 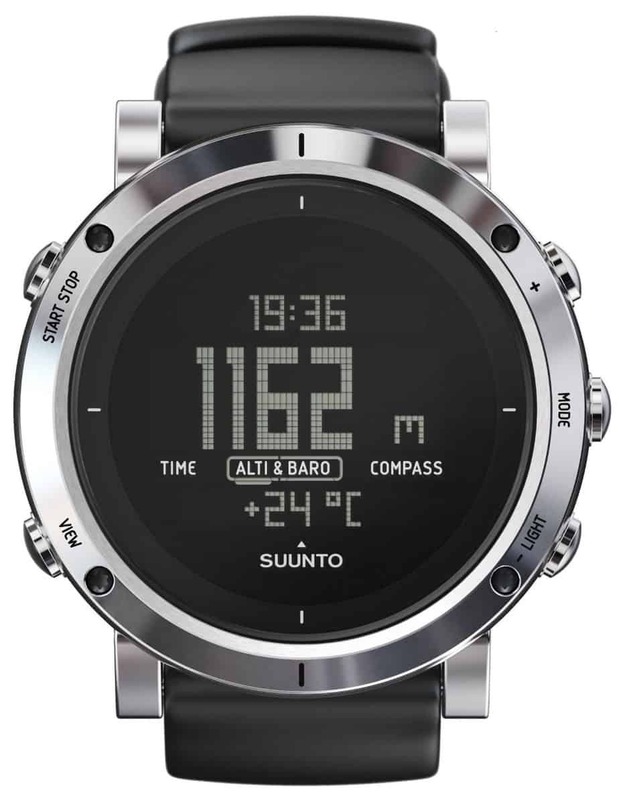 Suunto is a reliable and trusted brand that is known for manufacturing some of the best camping and hiking gear, such as compasses and watches. 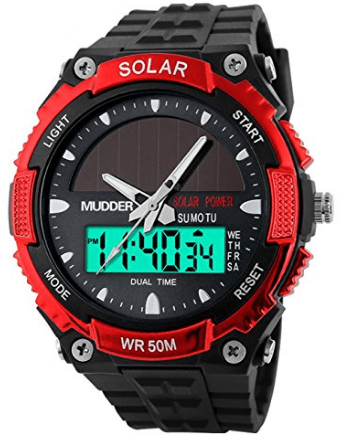 Check out this altimeter watch and see if it will be a good fit for you and your next camping trip. This watch has a sleek and stylish design, making it a great addition to your wrist. It is also suited to all altitudes, so if you are hiking in the woods or skiing in the mountains, it will work perfectly fine. It has an altitude graphic display that works alongside the altimeter so show you the current altitude. It also has a compass built into it so that you don’t end up getting lost, and a 10m depth gauge for snorkelling. This watch also features storm warnings, the temperature, the date, as well as the time. It also has several alarm functions and is waterproof up to 30m. It is the ideal daily companion for any outdoor adventurer. This watch is more expensive than most. The only thing this watch has going against it is the fact that it has a higher price tag than most other brands. However, it is worth every penny. It has a huge range of features that will be able to assist you when you are out hiking or camping. Plus, it is waterproof and can be taken snorkelling. It’s the perfect watch. Cassio is a big name, and they produce everything from watches to calculators. They are tech leaders, and their products carry a certain level of quality and reliability. 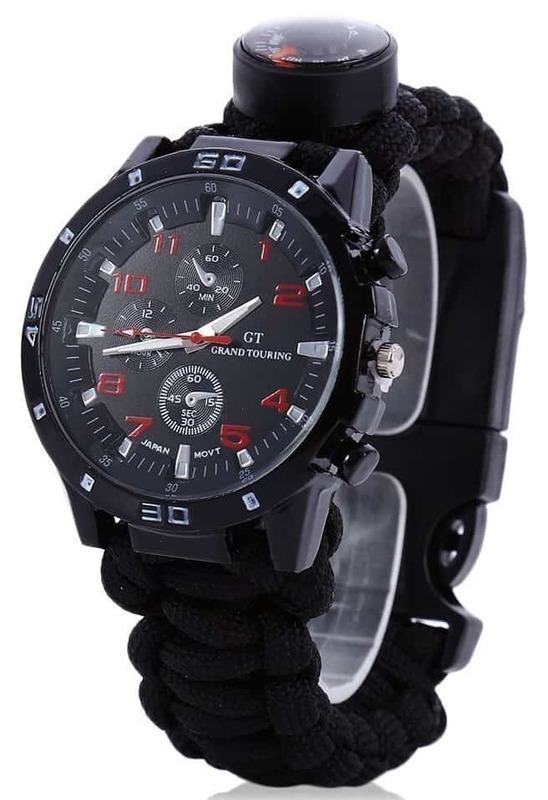 Take a look and see if this outdoor watch is the best one for you. This watch features a stylish design that is sure to have you looking and feeling great. It has a triple sensor installed alongside a digital compass, altimeter, barometer, and thermometer. So no matter where you are, you know what your surroundings are like. It features world time and also has a sunset and sunrise display. There is a 1/10-second stopwatch installed as well as a range of alarms. It also has low-temperature resistance is incredibly durable to keep up with your outdoor pursuits. This watch has a mid-range price, and offers a fantastic range of features for the price. It was designed to work with you when you are outside adventuring, and so the durability is excellent. No matter where you are, you’ll be able to see what the conditions are like and your altitude. Plus, there is low-temperature resistance for cold weather hiking. A great watch at an exceptional price. When you are out hiking, you need a good watch to keep you informed with regards to the time as well as to act as a quick compass should you need directions. This watch can do just that for you, and it might just be the perfect match for you. This watch not only has a stylish design, but it is also multi-functional. The paracord bracelet extends to a 3.6-meter rope, and there is even a flint and Firestarter on each end of the fastening, so you will always be able to keep warm. A thermometer and compass are also attached to the strap. There is a tool on the strap to cut rope, and the strap itself can be extended as a rescue cord that is made from the strong material used in parachute rope. It is also water resistant and incredibly cheap considering how useful it is. This cheap watch is the ideal hiking companion, offering you a load of survival features that can help you if you ever get into trouble. From creating a fire to unleashing a rescue rope, it’s a compact little lifesaver. So when you are looking for the ideal hiking watch, you should definitely consider this one. A barometer watch can be pretty handy when you are out hiking and camping, so it’s important to get one that is just right. Take a look at our top pick and see if it is the right one for you. This watch has a cool, modern, design that is sure to look great on your wrist. It is also sturdy and reliable, made to keep up with you and your outdoor endeavours. It has a range of great and easy to use functions that make life a little bit easier for you. 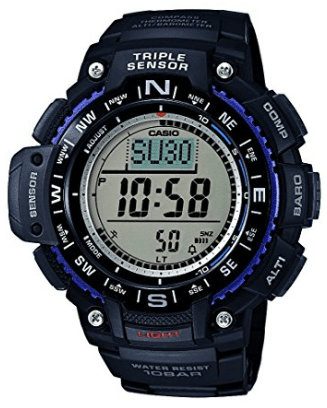 These features include the barometer, which is top of the range, alongside an altimeter, compass, pedometer, and distance tracker. It also tracks calories and shows you the latest weather forecast as well as the current temperature. 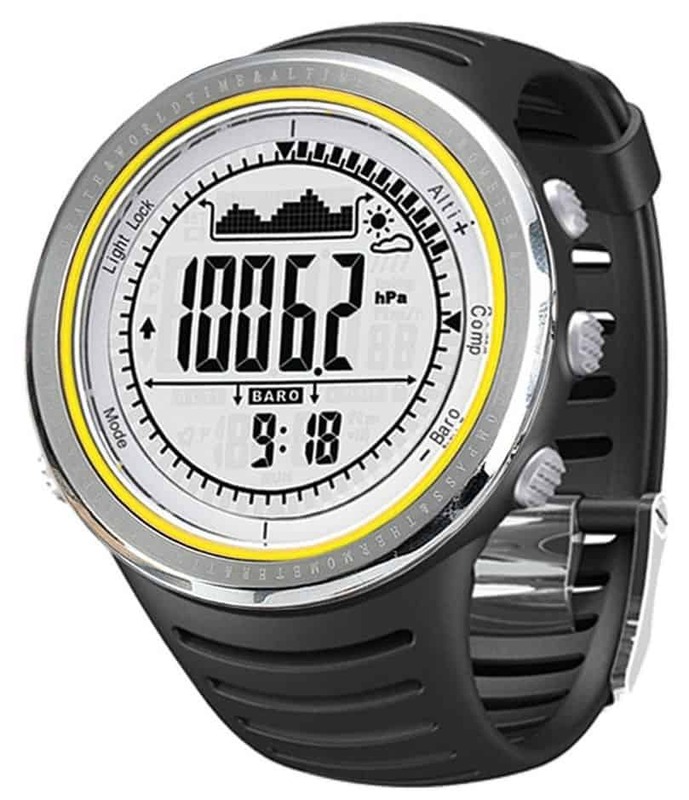 It also has world time functions and 10 contrast settings alongside a climbing rate measurement. This reasonably affordable watch has so many features stuffed into it that you will be discovering more all the time. On top of having a state of the art barometer installed, there is also the calorie tracker, climbing tracker, altitude display, and so much more. So if you are looking for value for money, then this mountaineering watch might just be the best one. Here are some other some other outdoor watches in case the ones above did not suit your needs. This lightweight watch is easy to set up and use, making it ideal for those who want something quick and easy so they can get straight on the trail. It’s water resistant and well-made, so you have a sturdy and reliable watch for your outdoor adventures. Plus, they tell the time in 12 and 24-hour, so everyone can have their preferred setting. A good watch if you want the basics without the added tech. This stylish watch runs on solar power, making it eco-friendly and a great option for hiking and camping. It features dual time zones, an alarm clock, stopwatch, and a LED backlight. It is also waterproof for up to 50M of immersion, which is quite impressive. It also has Japan quartz movement and several sports styles for fitness purposes in the settings. In addition to this, it has a light up function to show the time and date even in the dark. A great buy at a very low price. We have looked at a fantastic range of watches in this guide, all of which are suitable for outdoor adventures. Of course, each of these is the best outdoor watches in their own right, just as each is more suited to one need than another. Thanks to the categorisation, however, finding the perfect one for you is made a lot simpler. 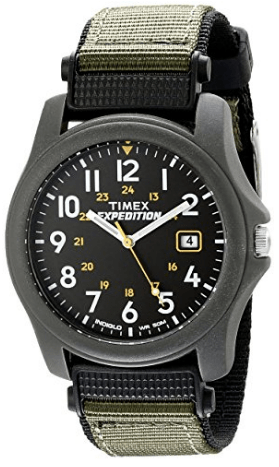 So when you go on your next hiking or camping trip, at least you will have a reliable watch to go with it. 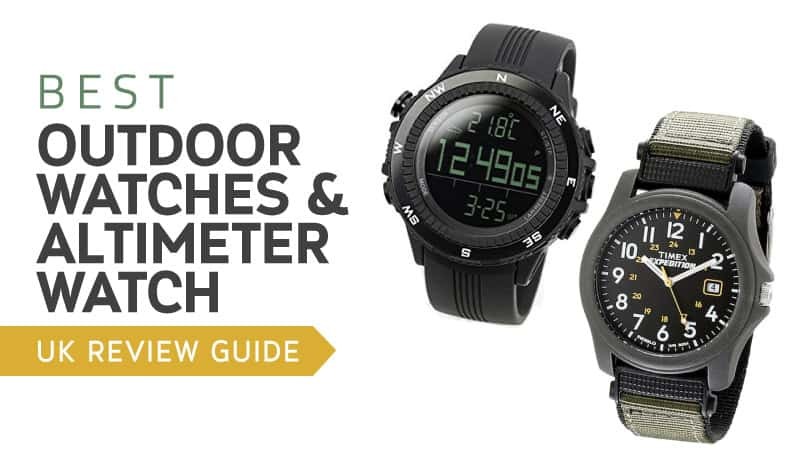 What did you think of our outdoor watch and altimeter watch selection? Are there any you would have added? We love hearing from you, so feel free to leave a message in the comments below.